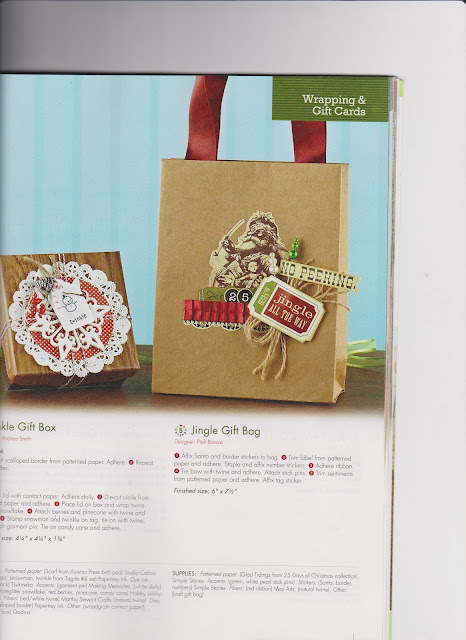 Thank you Paperie Designs' Studio and Hussena for the lovely feature post!! You girls totally made my day!! Love the fun challenge theme....I'm sure you all gonna have BLAST!!! CFC72 Create a Clean And Simple project inspired by your own blog header. 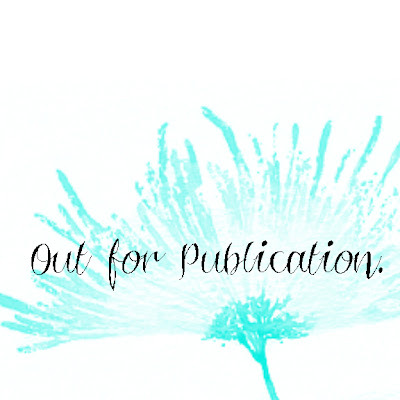 As you all know that I designed my own blog header...so I used the same graphics for my card. Super simple yet fun card...with a bit of scalloped border and few 2 mm clear Rhinestones(Pizzazz Aplenty). 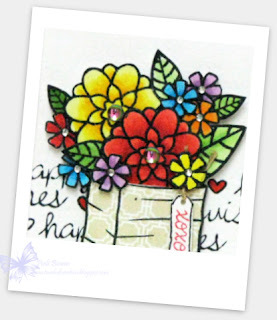 Digital Tuesday : Say it with Flowers. Fab 'n' Funky -Start with F...I've flower. Dutch Dare Card Challenge: CAS. 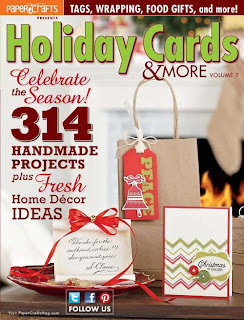 I love the PC-Holiday issues...they're just Gorgeous..inspires you to get started with your Holiday plans!!! 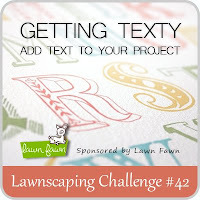 So join us...play along with CFC#72 and show us how your own blog banner inspired you!! You have until 12:00 pm EST next Thursday. 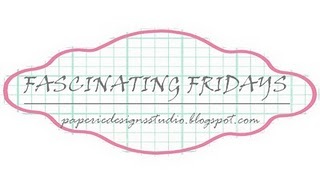 Can't wait to see your creations....don't forget to check out the gorgeous DT creations over at CAS-ual Friday Blog!!! Today I was sorting my old and new Halloween theme goodies . I see Halloween cards all over the blog land now, though in India they don't celebrate Halloween but still its always a fun thing. I will make some Halloween cards in next two weeks and share with you all. 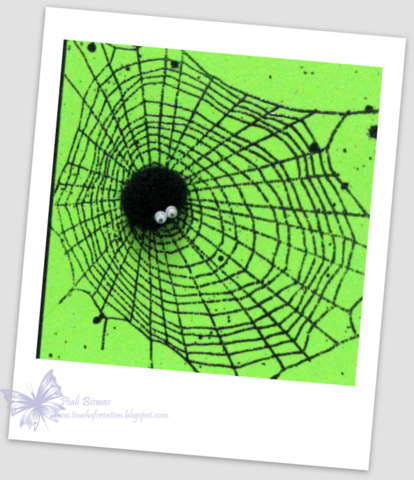 Today I thought of sharing some Halloween goodies with my blog readers!! 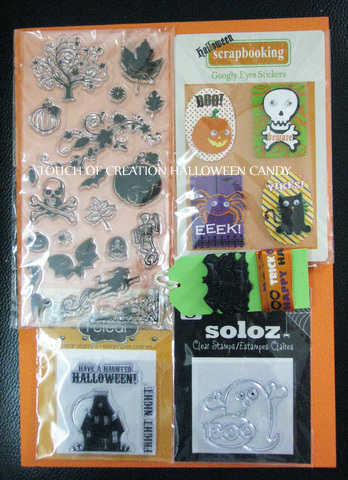 Here is a package full of Halloween stamps and embellies!! 2 types of Halloween ribbon. Let me know if you wanna win THIS spooky treat. Just add your name to this linky list. I'll pick a random winner on Oct 1st, 2012. 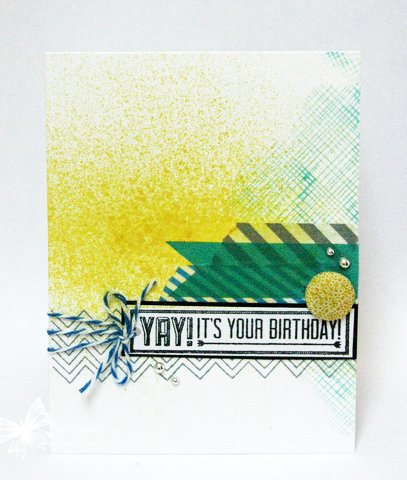 Today I'm back again ...and here is a card for few fab challenges. 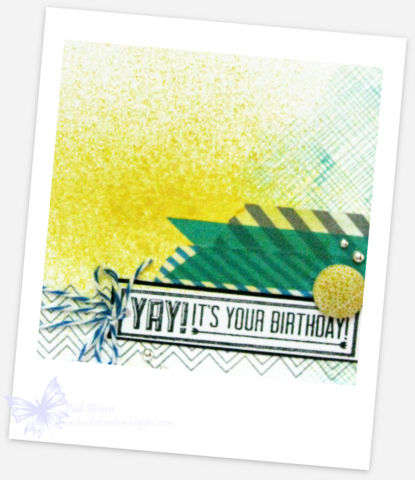 Just playing with new goodies from Simon Says Stamp! THIS is another new SSS stamp designed by Kristina Werner. The Perfect Sentiment -Masculine+ birthday. 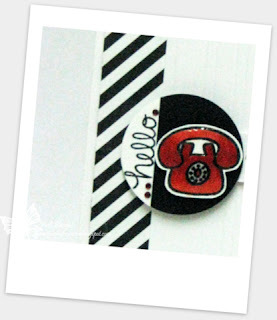 Simon Says Stamp and Show : Tape it up. Did I say lately that you all are AWESOME!!! Yes! I'm blessed to have such wonderful bloggy friends and lovely blog readers! Here is an AWESOME card!! 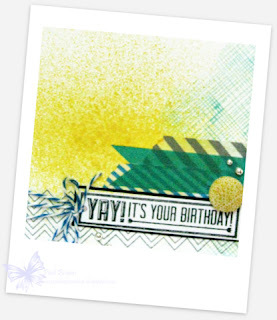 Looooove this NEW stamp set from Simon Says Stamp designed by Kristina Werner. The color scheme is inspired by current Embellish Magazine Challenge...gorgeous isn't it?? Did some simple dry embossing with mt Martha Stewart scoring board . All papers are from Echo Park except mini polka dot..its from My Mind's Eye. Embellish Magazine:Stripe + Polka Dot Color Trends Challenge. Simon Says Stamp: Emboss it. Creative Stamp Friends: New stamps. For CFC#71 post scroll down or click HERE!! Did you all see the current Tuesday Trigger pic over at Moxie Fab World??? Amazing Turquoise and Green combo with hint of gold...love it! Here is my card inspired by "Envy Becomes You".. When I saw Embroidery on the pillow ....I knew letterpress technique will be the perfect thingy to do to add texture. I don't have a letterpress so went for the Faux letterpress technique using Sizzix embossing folder and PTI ink. Up close it looks amazing!! 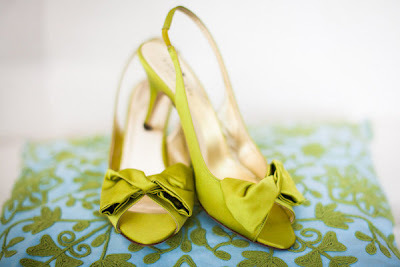 The bow on the shoe is just another gorgeous element...luckily I had the lovely May Arts Green Crushed ribbon ! 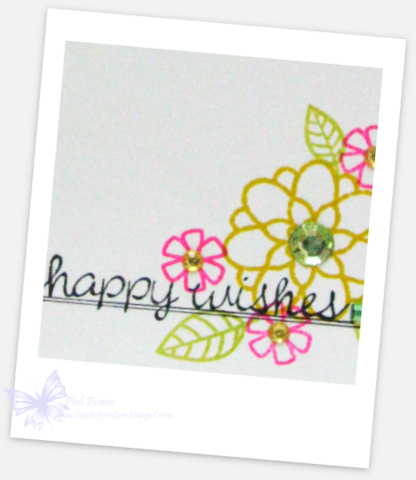 For the golden lining ...I used some golden cardstock.. love the shimmer!! Wish Only if I could take a better picture of my card ..this pic is doing the right justice! The sentiment is from WPLUS9 stamps. MFW-Tuesday Trigger: Envy Becomes You! Simon Says Stamp : Embossing. 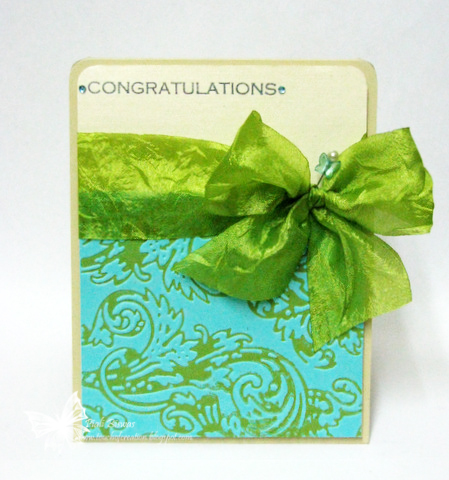 Going Grey With Scrap-Creations: Embossing. Fridays make me so happy! I'm so looking forward to the weekend , need to get crafty!! You know what Friday means!!! Perfect Challenge for the season...it started to feel like fall in USA I believe!! Here is my Fall Card..
Stamps are from There She Goes!!! 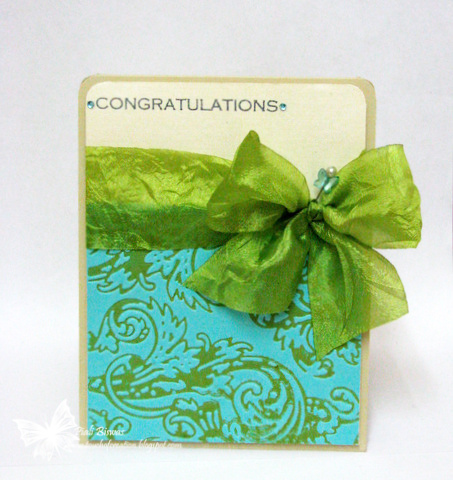 Very simple card...with just a lil' sponging & embossing..few embellishments! I love Fall colors...and miss it a lot here! Sweet Stamps : Shades of Autumn. 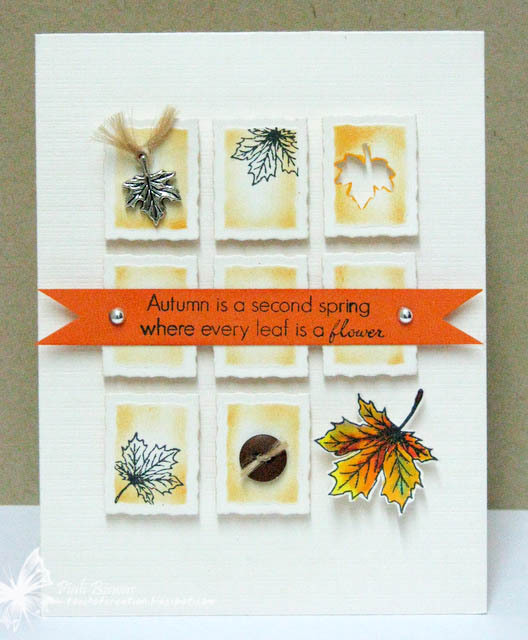 Addicted to Stamps Challenge : Autumn colors. Don't forget to share your CAS fall themed creations with us!! Hop over to CFC blog to check out the AMAZING DT creations!! I'm back again....with a lovely card!!! Love n' Breakfast for the xoxo tag and hearts. Just added a few blings(from Pizzazz Aplenty) and a lil' bit of washi tape!!! 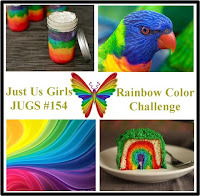 Just Us Girls: Rainbow challenge. 10 Minute Craft Dash #3!!! I've a super speedy card to share!! LOVE 10 Minute Craft Dash challenges....Super Fun!!! So here is my card with Challenge#3 colors.. 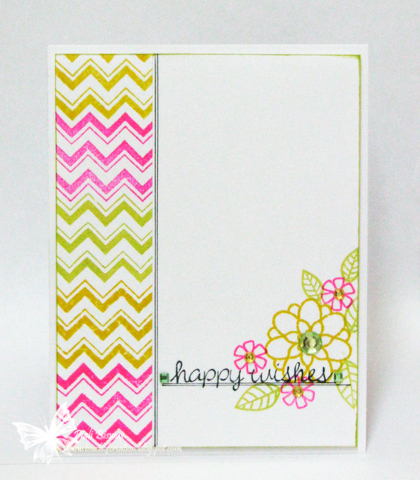 I used Lawn Fawn stamps for this card.... Chevron Backdrops , Flutter By and Lunar Lights(sentiment) sets!! 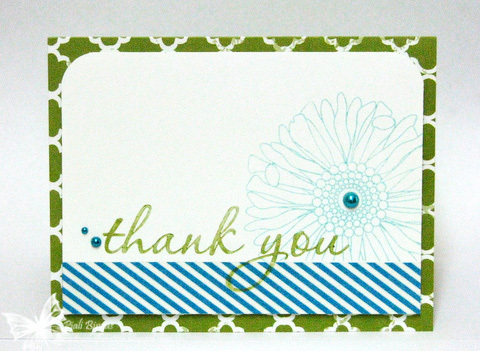 I got lots of queries and comments about these super fast less than 10 mins cards. How do you do it so quick?? Can't believe you did it under 10 mins!!! Oh! I can do any thing like that so quick!!! 1. KEEP IT SUPER SIMPLE!! 6. Okay! About cleaning the stamps...I just keep two baby wipes folded on the table, when required I just tap my stamps on it and clean( just like you ink your stamps). 8. If you want to use foam adhesive...go for Foam Tape instead of pop dots as you can save a lot of time on removing the backing. I put two long strip of foam tape, thats it ...Super quick. I'm not a Pro...so if you've some great tips Please share with us! Its pretty much DOable...just give it a shot! Paper Pretties : No DP. I'm back with a fun Halloween card!!! The colors are inspired by Dynamic Duos challenge!! The cute lil' spider is from K & Company!!! 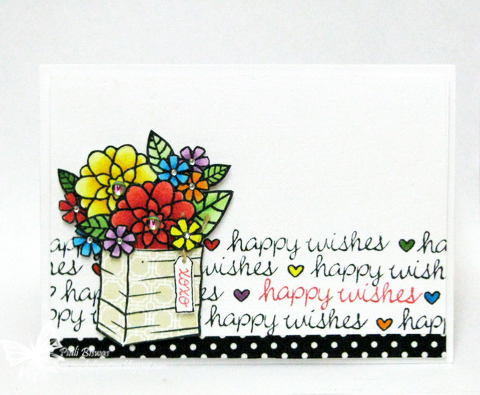 The sentiment and web stamps are from Stampendous. 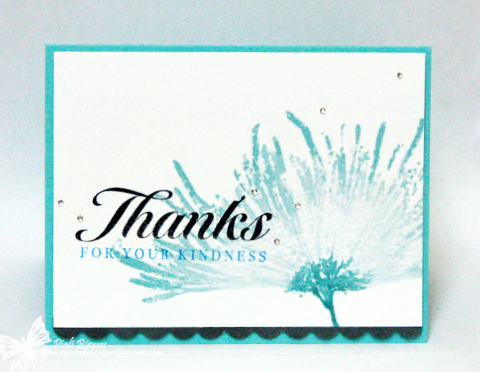 I heat embossed the background & the sentiment and added few random Black splatters ...quick & easy card !! 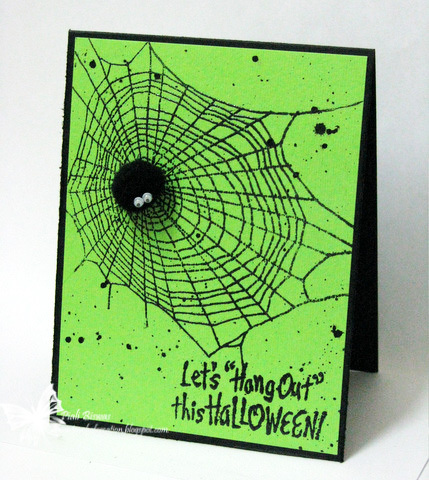 This is card is for the following challenges..
WOW Embossing Powder Challenge: Halloween. 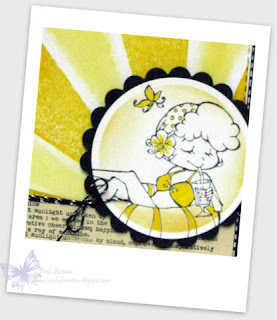 Weather wise its a bit gloomy over here....so I thought making my day brighter with some stamped Sunshine!!! 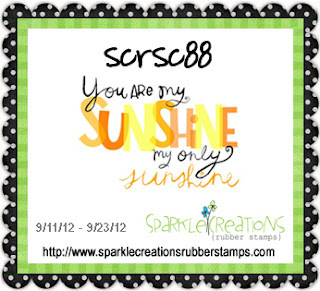 This week's Sparkle Creations Rubber Stamp Challenge is also based on Sunshine theme!! I used Swimming Lucy for my card today!! I also used Hero Arts Sunbrust background and Technique Tuesday stamps to complete the sunny card! I picked not to color the entire image...kept it pretty simple & FUN! Don't forget to checkout the SCRS store....I just spotted some great stamps on SALE!!! Scrapper`s Delights Paper Crafts : Make your own background. 2 Sisters: Black, White + 1 color. To play along in SCRS challenge, upload a photo of your project and provide a direct link in the linky widget at the bottom of the SCRS post. If you use an online gallery (e.g. Splitcoast), please also use the keywords SCRSC88 and SparkleCreations (no spaces). If you have a Facebook account and are a fan of Sparkle Creations Rubber Stamps, you can also upload there. Deadline for challenge #88 is Sunday, September 23rd @ 9 PM PST. Hello and Happy Friday !! Its time for new CAS-ual Friday challenge!! CFC69: Create a CAS project using Black & white plus one other color of your choice. 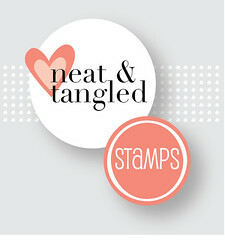 This week's challenge is sponsored by very new and AWESOME stamp company..
Prize: $20 GC for Neat & Tangled stamps!!! I finally got my Neat & Tangled stamp set....really wanted this one from the very 1st day of the sneak peek post. This set is called JUST HELLO. Loooooooove that lil' telephone... cute!! 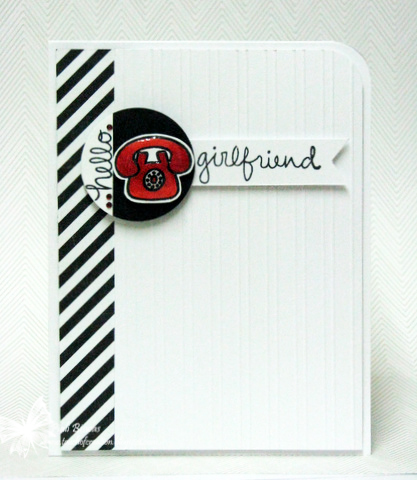 The black & white stripe paper is from Echo Park. Very simple card with three tiny red rhinestones(from Pizzazz Aplenty) lil' Copic coloring and some glossy accents!! Try It On Tuesday: Anything Goes. If you would like to join in....please post a direct link to your B/W+ one color projects....HERE. You've until 12:00 noon EST -next Thursday! Can't wait to see your take on this challenge..
As you know the challenge is to make a card start to finish in 10 mins or less with the pretty color combo!!! 3. Stamp sentiment and flower...QUICKLY!! Jackson's Digital Expressions : Anything Goes + CAS. Special Discount from Avery Elle!!! Sparkle Creations New Release Hop-Day #2! !